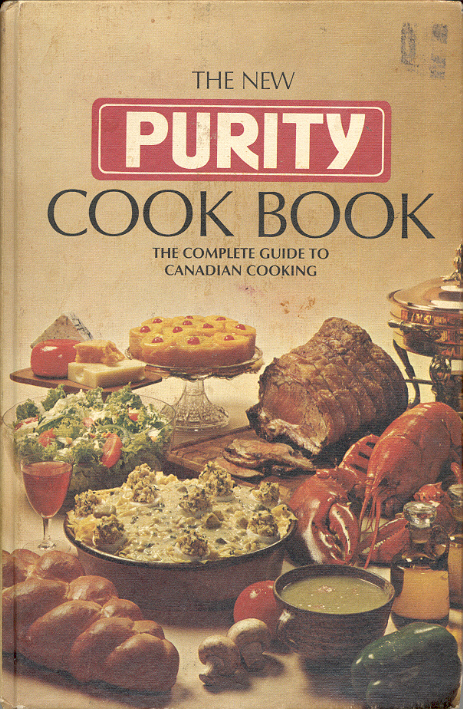 The New Purity Cook Book alleges, on its cover, that it is the complete guide to Canadian cooking. I’m not convinced that this is true, though it remains one of my most beloved books, though I only make one or two things from it. My parents had the book when I was growing up – apparently Purity is a brand of flour? – and that’s where our waffle recipe came from. I got my copy of the book at a thrift store for a dollar, which is actually pretty reasonable – there are gift coupons in the back of the book, and for $1.25 (cash or money order), you could, in the 1980s, have a copy of the cookbook mailed anywhere in Canada. It’s actually a pretty reliable book, with solid recipes for the kind of home-cooking you might have grown up with. There are the usual things – Pineapple Upside Down Cake, Enchiladas, and Salmon Casserole – as well as a handy guide to freezing, defrosting, and boiling the living hell out of vegetables until all that’s left is a weepy grey mush. There are also some pretty good recipes for breads and loaves, especially the Old Fashioned Porridge Bread, which you can make with leftover oatmeal. If you can find it for a dollar, it’s worth it. There’s a recipe for something called Chop Suey Cake, which seems to be a kind of inappropriately named fruit cake, and I want someone to make it so I can try it (but I don’t want to spend $20 on candied fruit to do it myself). I use the Purity waffle recipe, because it makes the waffles I was raised on, and, therefore, The Best Waffles. If you make too many (I always do), you can stack them between sheets of waxed paper and store them in a bag in the freezer; they toast up pretty nicely so you can have waffles even on weekdays. Sift together the dry ingredients. In a separate bowl, whisk together the liquids. Heat the waffle iron according to your waffle iron’s instructions. You may need to lightly grease the iron before heating, depending on what kind you have or how old it is. Pour batter into waffle iron, drop the lid, and cook until waffles have stopped steaming, and are golden and fluffy. Don’t lift the lid during cooking, or else they flatten out and don’t work as well for syrup-sopping. Waffles are our Sunday morning thing to eat while reading the funnies. Himself makes them, usually using Jiffy baking mix but occasionally referring to the 1948 Betty Crocker cookbook I inherited from my grandmother. It involves whipped egg whites and melted butter and now I want one. I think everyone has their favorite waffle recipe. And, it is not an obscene amount of syrup if the thing was CLEARLY made for holding the stuff. I say it’s using the waffle for God’s Intended Purpose, and I am not arguing with God on this one.